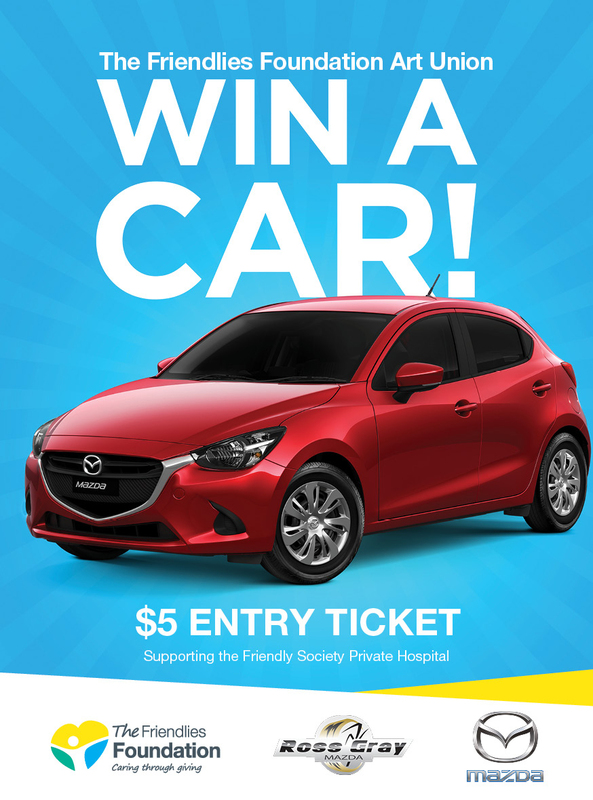 Win a new Mazda 2, thanks to The Friendlies Foundation and Ross Gray Mazda. Tickets are $5 each and can be purchased at the Friendly Society Private Hospital and Friendly Society Pharmacy. Purchase over the phone by credit card by calling 07 4331 1024. Eftpos facilities are also available. PRIZE: New Mazda 2 Neo, 4 Door Hatch, 4-cylinder petrol automatic, silver in colour with 12 months registration. Valued at $20,494 drive away. TERMS & CONDITIONS: Winner will be notified by telephone after the draw. Winner’s name will be published on the Friendly Society Private Hospital website and Facebook page. Prize cannot be exchanged for cash. The Friendlies Foundation staff, volunteers and management committee, and their immediate family (spouse or family members residing with them) are ineligible to enter.